We all know the importance of water. It’s the basis of our life and we wouldn’t be able to survive without it. It’s pretty scary to think that with all the abundance of resources some of us live our lives with there are still some communities that don’t have regular access to clean water. Well the people at UTEC, a University in Lima, designed a billboard that can help with this problem. We all know the air around us isn’t just empty, we are surrounded by all sorts of particles and gases and also moisture, lots of moisture. 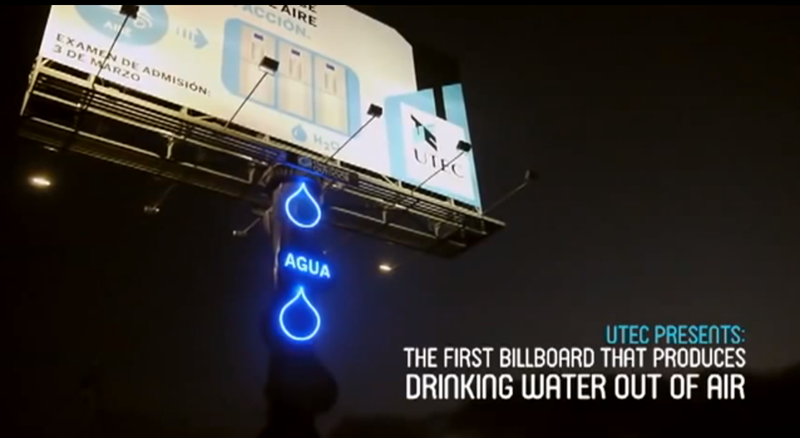 This billboard is designed to take the moisture out of the air and turn it in to usable and drinkable water. Not only have they made this common structure much more useful, they are also doing it to inspire young people to come to their university to learn and possibly come up with the next big thing that will save the world. ← More future technologies – thin and flexible circuit boards.